What is pickleball, you ask? In short, it’s a cross between tennis and ping pong. Picture a tennis court, but smaller, a tennis net, but shorter, a paddle and a wiffle ball, and that’s pickleball. Wikipedia explains it in a little more depth so you might want to check out their definition. I started playing with some friends in the fall and a few months later, I’m totally hooked. I play twice a week and I can’t stop talking about how much I love it Just ask my husband! I’m trying to get all my mom friends on board, because it’s truly the perfect sport for us moms. 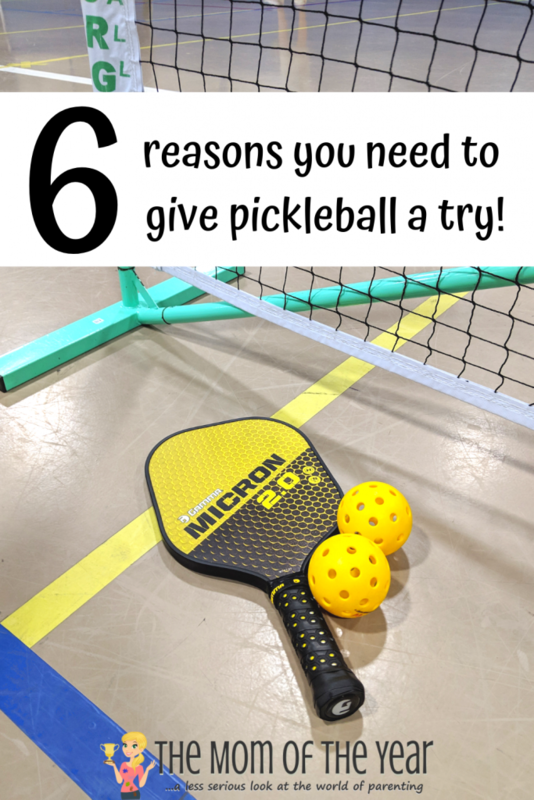 Read on for all the reasons why you’ll love playing pickleball too. When was the last time you played a game for fun? 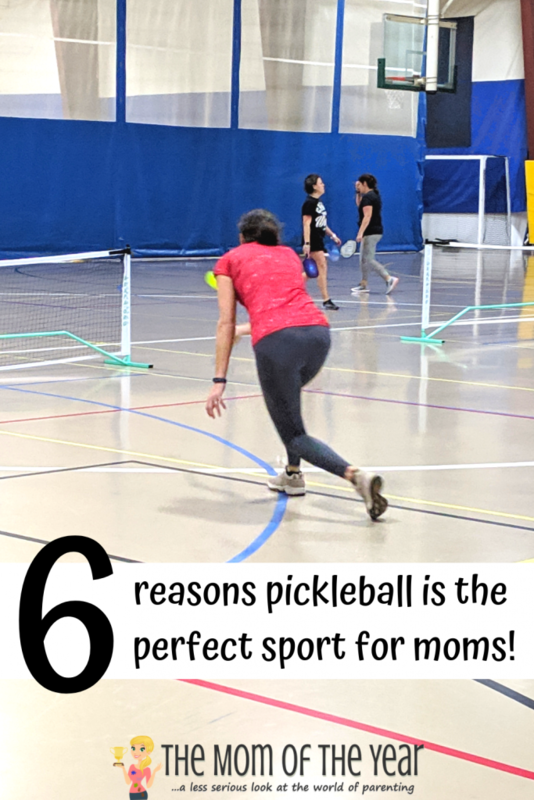 Honestly, my favorite reason to play pickleball is it’s fun! I’m having fun like my children have fun when they play games with their friends. I feel like I’m a little kid again, playing with my friends. My soul really needs this sense of playfulness. Raising kids is no joke and can be mentally exhausting. Playing a game for fun rekindles a feeling of lightness and joy that I haven’t felt for years and that feeling truly refreshes me. I’m a happier mom when I come home from pickleball. I used to run to keep in shape. It was a great stress reliever, it got my endorphins going, and it was a cheap, easy way to get my body moving. I truly enjoyed running for a lot of years. But, eventually, I got burnt out! Not only was I dealing with annoying minor injuries, I just bored with running. 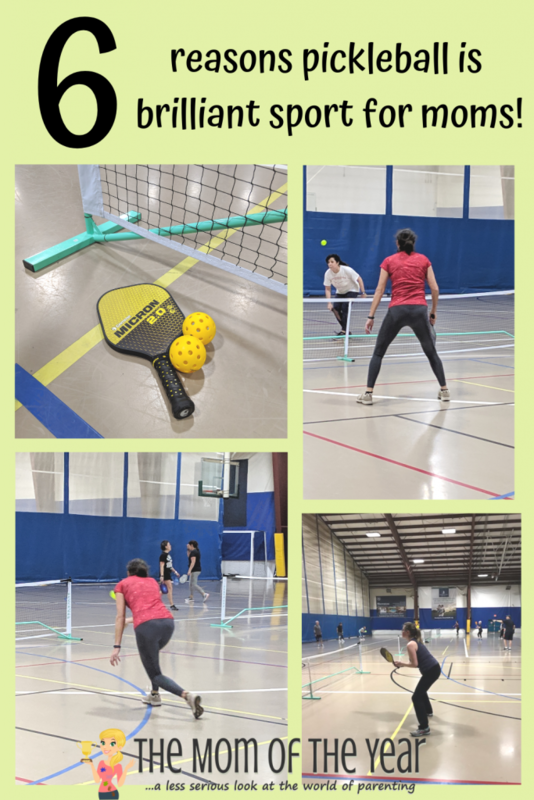 Pickleball is not boring! It is super fun! You switch opponents after each game so there is constantly a new challenge. I absolutely get a workout in, but I barely notice because it’s so FUN! Listen guys, I am not naturally athletic. I never excelled at team sports. My hand-eye coordination isn’t great, but I still love to play pickleball! 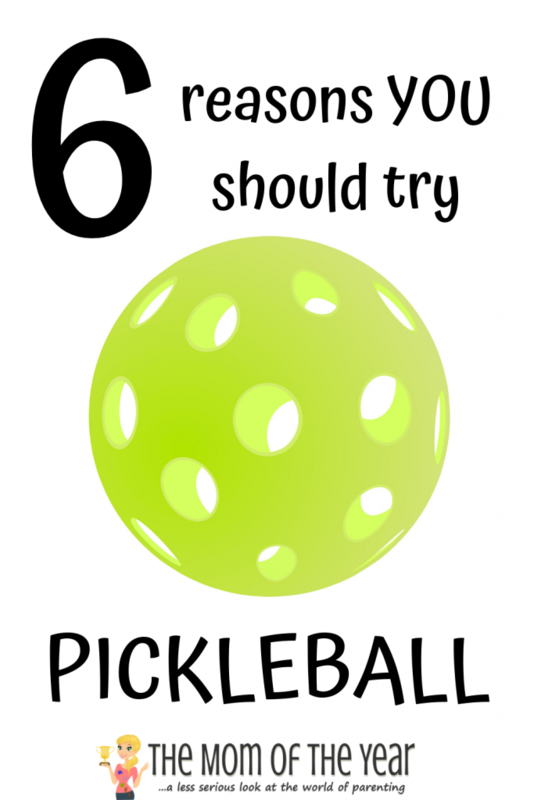 Here’s the good news for all my fellow non-athletes: you can easily improve your picklebal game. There are loads of videos to watch and lots of helpful people at the courts who will give you tips and strategies to use. I have improved so much since I started playing, and I’m sure I’ll continue to get better. When my children were babies and toddlers I was peopled out. I really enjoyed the quiet and solitude of a nice long run. But now, my children are in school and I work from home so I do get a little lonely. Pickleball gets me out of the house and gives me an opportunity to talk to other adults! Not only to I get to see my friends regularly, I’m also meeting lots of new great people. When you aren’t playing with your new pickleball friends, you can play with your family! Last weekend my husband and I took our four kids and our niece and nephew to the courts by our house. They ranged in age from 9 to 15 and guess what? They all learned quickly and we all had fun playing together. So, if your kids are a little older, they’ll be able to join you! Or, if you have little ones, you can bring some balls and toys and let them play on a free court while you and your friends play! Pickleball is a fairly cheap way to exercise. I’m fortunate to live near a park that has two pickleball nets, plus paddles and balls to use free of charge. So during the warmer months, I can play for free. When it is cold, I play at a rec center that charges a drop in fee of $5. If I go twice a week, that’s only $40 for the month, which is far cheaper than any gyms in my area! Plus, I don’t need to pay that fee when it’s warm. When I first started playing, I borrowed a paddle from a friend, but when I decided to play regularly, I bought my own. The prices for paddles vary widely depending on how serious you are about your game. I’m in the “I play for fun” category so a $40 paddle fit my needs! So, did I convince you? Are you ready to start playing pickleball? See you at the court! It’s so fun Janine! You’ll love it! Jamie you should definitely try it! Look it up on you tube! Both my husband and I “drank the Pickle juice” and are totally obsessed! We just retired, so we’re quite a bit older than you gals (61 & 64)- but we’ve got couples playing who are in their 30s & 40s! My sister-in-law and her husband in Maine play. I have been wanting to try this, too! We put up a badminton net in our yard and play each summer, but it would be nice to try something different! Thanks for the suggestion! It’s so fun Ginny! I hope you give it a try this spring! Robin! This comment made me laugh out loud! My husband and I took the kids to play last weekend and I have to admit, it was a different experience than playing with grown ups! I play with a bunch of grandmoms and grandpas (altho i am not) and we have a total blast!!! Absolutely right C! I get beat by grandmas on the regular! Um, yea! Been playing for a few months and LOVE it! Looking for more time to schedule it in! If your visiting AZ let me know – we play year around! I am in AZ, where do you play? I have played at SCC twice. Trying to find more east valley games. Even more east than Scottsdale. I found several places to play from joining MeetUp.